When I brought my shirt from Simone Abbarchi back to him in June (or rather his assistant, Gianluca) we ended up making quite a few changes. This may be a cause for concern, though I will reserve judgment. I had had one fitting originally, in a trial shirt, before having this final grey one made. And as I said in the post on that completed shirt, the shoulders were noticeably too tight while the body was a bit too big. 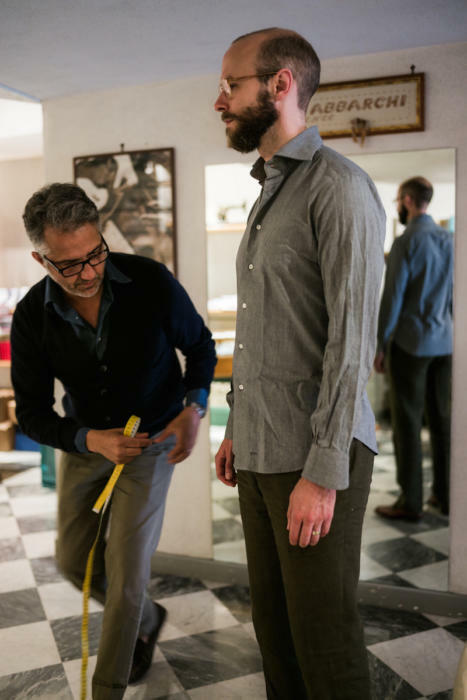 Neither were big problems, but they certainly needed to change for the next shirt, so I went in while at Pitti in June to have a few changes made to the pattern. Gianluca took quite a lot in at the waist, lengthened the sleeves slightly, and widened the shoulders. In retrospect, they were quite substantial alterations. Why is this important? 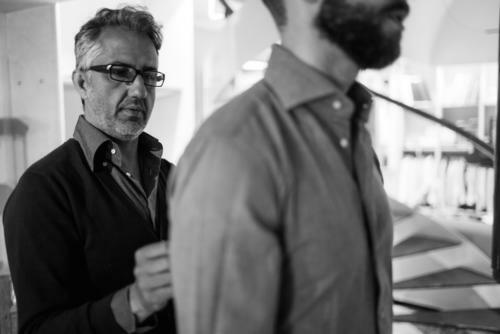 Because the aim of anyone seeing a shirt maker should be to perfect a pattern – usually after two or even three shirts, rarely after one – and then be able to order consistently and with confidence. Shirts should be a relatively inexpensive purchase, compared to suits or shoes, and they will need replacing more frequently. You are also much less likely to need or want different styles, again unlike suits or shoes. 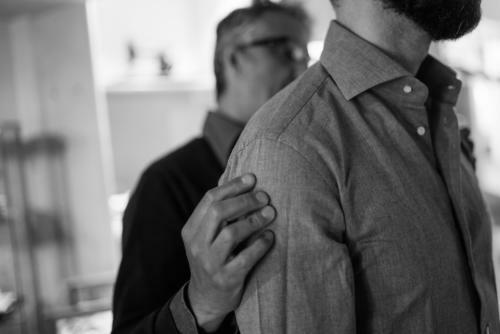 So one good shirtmaker with a great pattern is a lovely thing. Simone comes to London and New York twice a year, and both trips are coming up. He is London next week – September 15 and 16 – at 35-36 St James’s Place. And in New York from October 7th to 15th at the Michelangelo Hotel (152 W 51st St). Email simone.abbarchi@gmail.com for appointments. 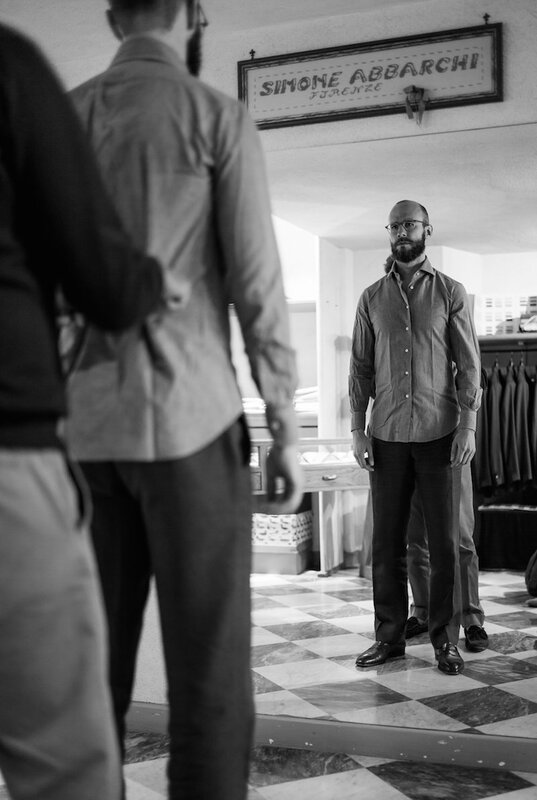 You can follow the discussion on Simone Abbarchi shirt fitting by entering your email address in the box below. You will then receive an email every time a new comment is added. These will also contain a link to a page where you can stop the alerts, and remove all of your related data from the site. Does the shirt look noticeably more blue in the reflection in the mirror in the final picture, or is it just me? The benefit of bespoke is the unique pattern and construction (jackets = canvasing etc.) but given the simplicity of shirts and the relatively high quality of RTW shirts do you really find a large difference in fit between the two (accepting that bespoke shirts offer excellent comparitive value and can cost lest than fashion RTW examples). I ask this as modern RTW sees a more fitted, slimmer pattern than in previous periods. For readers could you also elucidate on some of the more minor advantages that a bespoke shirt brings in addition to the general fit (collar choice etc.?). Does Simone actually do bespoke for London only clients? I have an appointment on this visit, but the push seems to be MTM. Reading a few other reviews I found it would seem bespoke is only available if you have made a trip to Florence at least once. Are you now happy with the shirt from Simone? Received it this evening… it’s perfect. What a relief. Off-topic slightly but any idea how much the bespoke shirt service at Ede & Ravenscroft costs? I’ve seen various prices, ranging from £150 to £300, bandied around on the internet and I’m not sure which is accurate. Any thoughts on how this service is likely to compare with that of any of the Italian makers that visit the UK? I believe E&R bespoke shirts are closer to the upper figure. I had some made years ago at the Chancery Lane shop and they lasted a long time and were a very good fit. Switched to Sean O’Flynn as he was a bit cheaper. Hi Simon, slightly off topic but was curious about your opinion on Dainite soles? I have them on a pair of Vass chukkas and find myself wearing them any time it might rain (which is more often than you might think!) I would imagine it is even more frequent in London but I don’t believe I’ve ever seen pictures of you wearing them. Do you own any? I’m debating having a pair of monk straps made with them, for a bit more variety, but am worried they might be a bit too chunky for the style. I am not sure I would go with Dainite on a formal shoe. Perfect for a suede chukka though. I have been getting shirts from Simone for ten years, really good value. Happy to hear your shirt fit. I recently got a few sea island shirts from him, they are very nice. Any thought to getting a suit or sweater from Simone? Nice article as usual, can I please ask you Simon and others nice shirt brands that cost less than 75 pounds. Also I can’t really find a nice white shirt that it is not a bit transparent I really don’t like that, unfortunately I don’t like oxford fabric that much, any suggestions? I’m afraid you won’t find much that can be considered ‘nice’ for less than that Antonio. There’s simply not much in terms of quality to talk about at that end of the market. thanks Simon, can you don’t reccomend your best brands with a good quality price/ratio? If they are nice I don’t mind paying, especially I really need a nice white shirt that it is not transparent. When you have a moment, I have a query regarding shirt collars (I have had a trawl through the site but I can’t find a specific answer to my question), I am currently having some shirts made and from an anatomical point of view I am blessed (cursed?) with a long thin neck. My instinct says I need a higher collar on the shirt to achieve the most flattering fit and balance for my physique, would you agree? If so, I assume that it is the collar band of the shirt that needs to be wider to achieve this. Do you have any thoughts on this question and on how wide might the collar band could be constructed before it looks odd or affects the collar part of the shirt adversely? I agree, it should be in proportion to the neck and therefore should be a little higher. However, don’t overdo it. If anyone notices you have a particular high shirt collar, you’ve gone too far. It should merely seem harmonious. If you don’t mind me asking, is your Abbarchi shirt sleeve seam in line with the side seam? Or is it off set?